The built-in accelerometer in the iPhone and iPod touch handles many tasks — rotating photos or Web pages when you turn the device, controlling games, and even initiating random searches on some apps. But Vibration proves that the accelerometer is capable of much, much more. Diffraction Limited Design’s $5 app can transform your iPhone or iPod touch into a scientific instrument. See What’s Shaking: Vibration plots accelerometer responses in all three axes in real-time. A sliding bar allows you to select points to display the values. Vibration uses the accelerometer in your mobile device to create a vibration spectrum analyzer. While sophisticated instruments are available for performing complex vibration analysis, Vibration gives you some basic capability for a fraction of the cost. Uses for such a tool include predictive maintenance by measuring bearing defects or detecting mechanical misalignment—useful for engineers or mechanics. Software developers can use this capability to get accurate measurements of the accelerometer when developing other motion-sensitive apps. You start by adjusting settings such as the sample rate and number of samples along with acquisition time and vertical scaling. Once your settings are entered, tap the sample button, and a real-time display shows your vibration magnitudes on all three axes of motion. You can slide you finger across the resulting three plots to display the individual values. Double-tap to zoom in on a particular section of a plot. 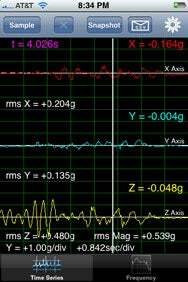 Tap the frequency button to perform a Fast Fourier Transform of the results to analyze the frequency components. Once you’ve made your measurements, you can save snapshots of both the time and frequency plots to your photo library and export the raw data via e-mail for further analysis. There is also an option to calibrate the accelerometers before making additional measurements. Another nice feature is the ability to set trigger points for each of the three axes. Vibration really taps into hidden capabilities of your iPhone by turning it into a sophisticated measuring device. Despite the technical nature of its purpose, the app is very user-friendly, making basic vibration recording and analysis a snap. Vibration isn’t for everyone, but if you’re in a situation where quick and dirty vibration measurements are needed or you really need to understand the responses of the iPhone accelerometers, take a look at this app. Vibration is compatible with any iPhone or iPod touch running the iPhone 2.x software update.